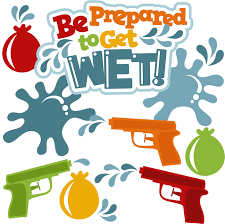 *Parents, we are not expecting you to attend the Water Party, but you are more than welcome to join in on the fun! Just to keep you up to date, our intentions were to have an open house extravaganza for this current unit of inquiry, next Thursday, however, the unit has taken an alternative path. Our student inquiries were hugely inspired by our Grade 8 students as well as Grade 3 writers. Our students will be sharing their thinking and progress with this audience instead. We appreciate your understanding and flexibility. Please don’t forget to send in any water play equipment (we will return that afternoon) and snacks for Monday, June 12. 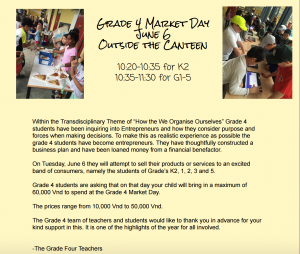 Thursday, June 8 is the Grade 4 Market Day, they have asked students to bring in 60,000VND. And Library books and any other school books or class readers need to be brought back to school- ASAP. The End of Year Water Fun Extravaganza! On, Monday, June 12, we are planning a party to celebrate the end of the year, and wow, has it been a good one! Comments Off on The End of Year Water Fun Extravaganza! 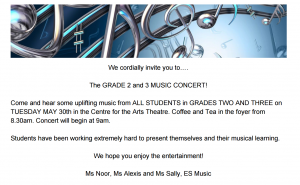 The Grade Two and Grade Three Music Concert will be held on Tuesday, May 30th at 9 am. We are excited to bring all the wonderful work the students have been doing in Music, Choir and Ukelele to the stage and perform for the UNIS Community! Please note the following information about the performance. Students will come to school at the regular time on Tuesday, May 30th, and will be brought to the Center for the Arts by their homeroom teacher. Coffee and tea will be served for parents in the Center for the Arts Foyer at 8:30 am and the music concert will begin promptly at 9 am. Students should wear black pants or skirt and a white shirt. Please send these clothes to school for the dress rehearsal on Monday, May 29th. We look forward to seeing you on Tuesday morning. Thank you so much for your support. 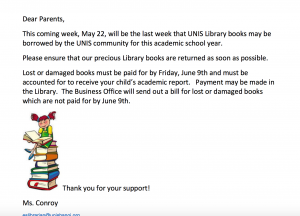 Start looking for those Library books….. Comments Off on Start looking for those Library books…..
We are on the final stretch towards the end of the year and only weeks away from having third graders on our hands. The time has flown by however there is still lots of learning to be done. Here is a snapshot of the upcoming learning taking place in the whole of grade two. Unit of Inquiry: How We Express Ourselves- Cultures express creativity in many ways- is our central idea. How do we know what influences our creative choices? What forms can we choose to express our cultures? Save the Date! Thursday, June 8 we will have an Expression Extravaganza from 2:10-3:20- we hope you can join. A range of nouns and noun groups (common and proper) are used to describe people and places. Descriptive words and sentences are used, relating to: size, colour, shape, number, texture, position, and action, to describe a noun and noun groups. Action verbs and relating verbs (e.g. is, was). Predominate use of simple sentences and compound sentences using simple conjunctions. Student demonstrates some use of complex sentences. A huge thank you to all of our parents for supporting our very first Explorer Fair this afternoon. We weren’t sure how successful it was going to be or how the students would enjoy the experience, but from the huge smiles from everyone, we think we have a hit on our hands. It was so wonderful to see the parents listening to all the children present, asking questions and supporting all of our little learners. We aim to have some pictures up tomorrow of the proud smiles of all, including teachers. It truly was an amazing event. If you have any feedback for us about your experience, please pass it on. 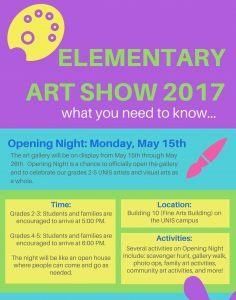 Please remember that Monday at 5 pm is the Elementary Art Opening for grades 2-5 in the Center for the Arts. And we are beginning a new PE unit next week. Grade 2’s will be starting their trampoline unit in PE next week. It will be a chance for students to create sequences using shapes and movement whilst in the air. They will also work on being safe and being caring towards others. to use as the bed of the trampoline can be abrasive. They do not need to wear these clothes to school and they can keep them in their classroom just for PE. Upcoming Art Events in G2 Save Those Dates! Comments Off on Upcoming Art Events in G2 Save Those Dates!